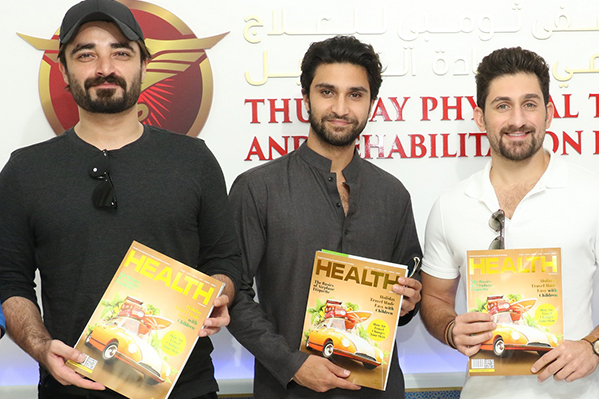 Renowned Pakistani actors Mr. Hamza Ali Abbasi, Mr. Shaz Khan and Mr. Ahad Raza Mir visited Thumbay Medicity – Ajman, on 5th August 2018. 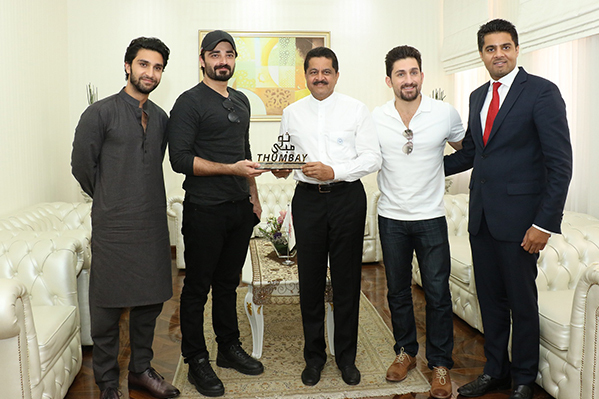 The celebrities were greeted at Thumbay Medicity by Dr. Thumbay Moideen – Founder President of Thumbay Group and Mr. Akbar Moideen Thumbay – Vice President of the Healthcare Division of Thumbay Group. 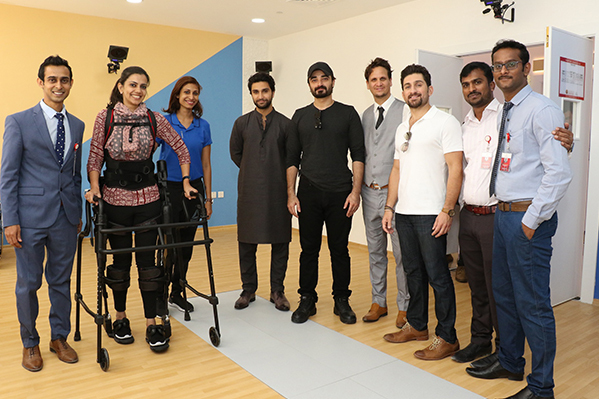 Touring the hospitals and the university, the actors commended Thumbay Medicity for the excellent facilities for healthcare and medical education. 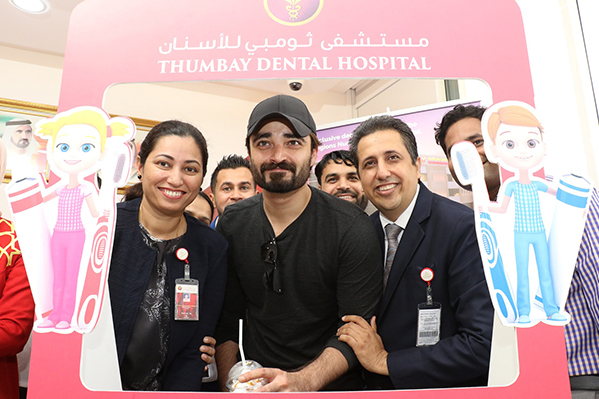 They experienced the various services at Thumbay Dental Hospital – the first private dental hospital in the country and the largest academic dental hospital in the Middle East region’s private sector, as well as Thumbay Physical Therapy and Rehabilitation Hospital – the biggest and most advanced hospital for physical therapy and rehabilitation. The vision, mission and future directions of Thumbay Group and Gulf Medical University – the region’s leading private medical university, as well as the University’s advanced training and teaching facilities were also introduced to the guests. 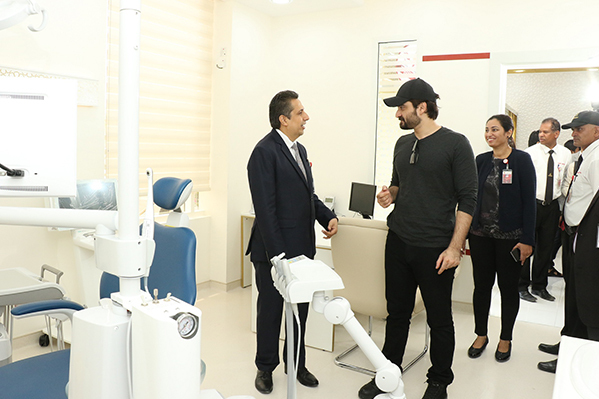 The celebrity guests called the facilities at Thumbay Medicity “amazing”, especially in terms of technology and the range of services available. They appreciated Thumbay Group’s efforts in bringing the latest technology and innovation in healthcare and medical education to the region. Dr. Thumbay Moideen said that Thumbay Medicity was envisioned as the healthcare and medical education hub of the region, well-equipped to serve a floating population of 20,000. “The soon-to-open 500-bed academic hospital – Thumbay University Hospital – the largest private academic hospital in the region, combined with the dental and rehabilitation hospitals make Thumbay Medicity a unique destination for specialized care. Thumbay Medicity is also a referral facility to which primary and secondary care hospitals and clinics refer serious cases,” he explained. Thumbay Medicity also houses Body & Soul Health Club and Spa, The Terrace Restaurant, Blends & Brews Coffee Shoppe, Thumbay Pharmacy etc. Moreover, the specialized hospitals of Thumbay Medicity are Academic Health Centers of the Gulf Medical University Academic Health System (GMUAHS), which give them the unique advantage of having the expertise of doctors who are also academicians and researchers. GMUAHS has the distinction of being the first private academic health system in the region. Thumbay Medicity is an important landmark in Thumbay Group’s transformation into a leading healthcare provider in the region. “We are pursuing a massive global expansion plan at the moment, according to which the Thumbay academic hospital network will have a total of 1000 beds in the UAE, 1500 beds in India and 750 beds elsewhere in the Gulf and Africa by 2022,” said Dr. Thumbay Moideen. A state-of-the-art hospital focusing on all aspects of physical therapy and rehabilitation. Copyright © Thumbay Physical Therapy & Rehabilitation Hospital. All rights reserved.